1. Flags, Aberdeen Fire Station, Aberdeen, Hong Kong. 2. 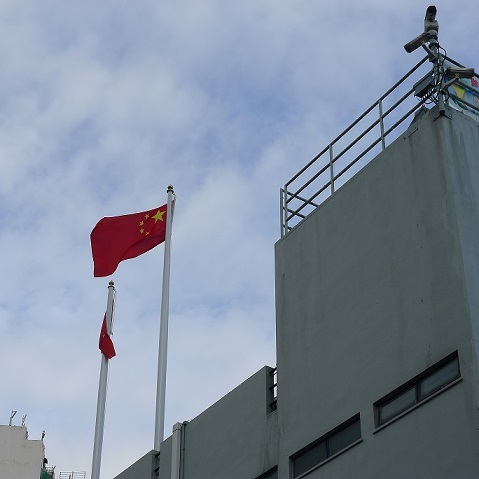 Flags and security cameras, Aberdeen Police Station, Aberdeen, Hong Kong. 3. Flags, near Star Ferry Pier, Tsim Sha Tsui, Kowloon, Hong Kong. 4. 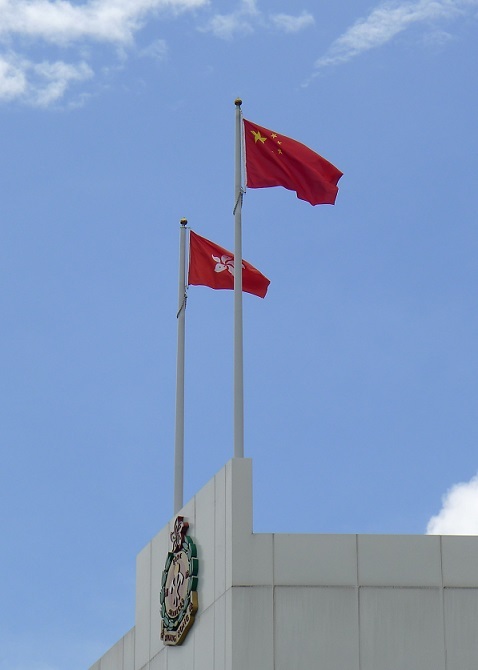 Flag outside the Liaison Office of the Central People's Government in the Hong Kong Special Administrative Region, Sai Ying Pun, Hong Kong. After the riots of 1967, Hong Kong’s British administrators flew their flag much less often. Provocative for some, but legal at the time, hundreds of Taiwanese flags would line the length of Hennessy Road in celebration of the Double Tenth; that was, until 1997. Their appearance is furtive now. The Union Jack – the British flag – was also, prior to 1997, on the fuselage of each Cathay Pacific aircraft. It was a reminder that ‘Hong Kong’s airline’ was actually British-owned. It still is and now the flag’s absence from the company’s fleet of aircraft is a political concession, for a Hong Kong-domiciled, British airline in a place of Chinese sovereignty. And now flags are really flying over Hong Kong. The decision for the placement, the showing, the flying of a flag – or not – is an unequivocal power statement. It’s about sovereignty. Flagpoles are an architectural feature that architects rarely need to install on buildings. However, as I write, Hong Kong is having an official construction spree of flagpole installation on government buildings. Pairs of flagpoles, one slightly stooped beneath the other, each regally topped with bright gold anodized gold balls, are appearing on Hong Kong’s most prominent community facilities: fire and police stations - and other government-run buildings. I associate flags with borders, legislatures, national or extra-territorial places and institutions. On residential buildings, a flag generally announces the occupant’s national pride or its extreme, nationalism. I suspect the latter is the motivation for Hong Kong’s flag-poling surge. It is, at this time of debates about HKSAR Chief Executive and legislative electoral reform, a delicate matter. I can’t see, in this climate, officials’ enthusiasm for flags to be: flagged. This article was originally published in Perspective architectural magazine, September 2014.